In 1988 I was invited to give a lecture on AIDS and surgery in the city of Örebro, Sweden. 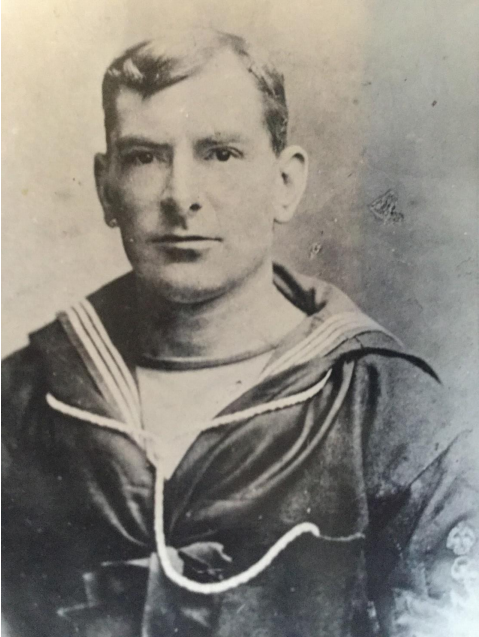 I knew that my grandfather, Chief Petty Officer 1st Class George Palmer Saunders, had been buried in the Norwegian city of Egersund soon after his body washed ashore following the Battle of Jutland that raged between May 31 and June 1, 1916. After the meeting, I took a few days off and flew to Norway to find his grave. I eventually landed in Stavenger on the southwest coast, rented a car and drove for about three hours through beautiful countryside to Egersund. It was a Sunday morning. I made inquiries and was directed to a church. Fortunately, the deacon was working in the graveyard and spoke excellent English. When I explained the situation, he asked my grandfather’s name. He took me straight to the grave. Standing with a skullcap, I found myself in the curious position of reciting Kaddish over a grave bearing a cross 72 years after his death in the frigid waters of the North Sea. Who was he? No member of my generation seems to know much about him. 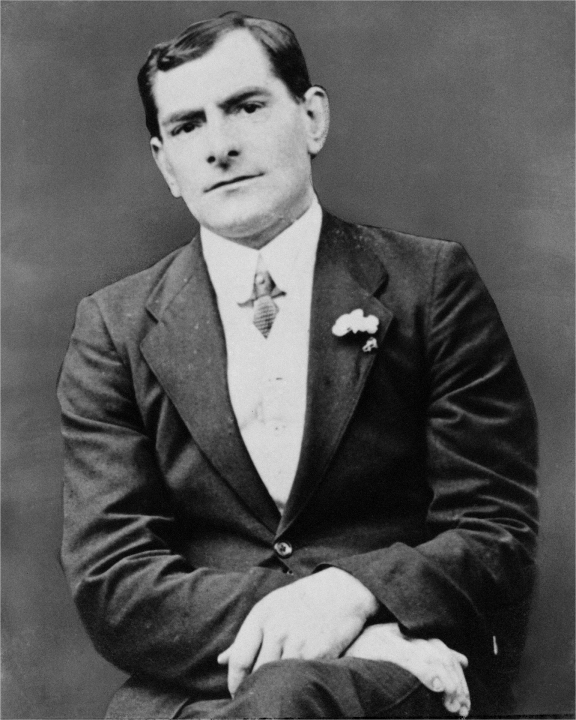 He was born on Oct. 20, 1876 and lived in Wandsworth in southwest London. Information obtained by my cousin Peggy Adam indicates that he held the rank of “boy 2nd class” in the Royal Navy in 1892, at the age of 16. My mother said he had been a hard-hat diver in the Royal Navy during the Boer War from 1899 to 1902. 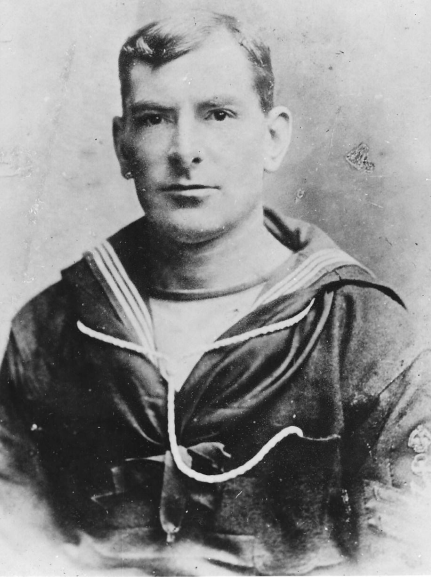 In fact, he held the rating of “diver” in 1897 and remained in the Royal Navy until 1906, when he was discharged as medically unfit. He married my grandmother Jane Elizabeth Welsh in 1904 at the St. Thomas a Becket Catholic Church in Wandsworth. My grandfather re-enlisted after the 1914 assassination of Franz Ferdinand by the Bosnian nationalist Gavrilo Principe in Sarajavo — the spark that ignited World War I. 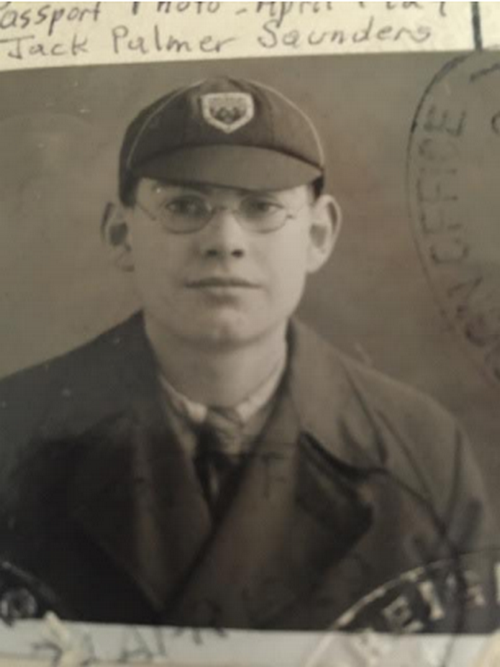 My mother said he was picked up at sea after one of his ships was torpedoed early in the war. She later overheard him confiding to my grandmother that he didn’t think he would return after his next deployment — an accurate premonition. In 1969, I took a walking trip across Yugoslavia and stood at the spot where Principe fired his fatal shots. On my return home, I stopped in the United Kingdom to visit my mother’s family, whom I barely knew. I met Uncle Jess, the husband of one of my grandmother’s sisters. He told me that he had been a good friend of my grandfather and that he was an excellent man. I took that advice to heart. My cousin Peggy Adam organized a family gathering in June 2016, to celebrate the life of our grandfather on the occasion of the 100th anniversary of his death in the Battle of Jutland. In his honor, I have written this little monograph in an attempt to recreate my grandfather’s last experiences, based on the written record. I am not a professional mariner nor a historian, but I hope this necessarily simplified account of the Battle and the role of our grandfather’s ship, HMS Tipperary, will help our family understand what happened and keep his memory alive for generations to come. Great Britain, steeped in a proud maritime tradition, was the world’s greatest naval power at the turn of the 20th century. The Royal Navy was essential to keep the sea lanes open providing raw materials to fuel British industry and access to markets for manufactured goods. If Germany were to have any hope of winning the war, blockade of the island nation was necessary to cripple industry and starve the people into submission. To do this, destruction of British naval supremacy would be required. Two new weapons threatened to change the balance of naval power — dreadnoughts and submarines. HMS Dreadnought was commissioned by the British Navy in 1906. This was a revolutionary battleship with heavier-caliber guns than previous ships possessed, as well as steam propulsion. battleships — dreadnoughts — that were generally acknowledged to be superior in armament and armor to their British cousins. This technological advantage may partially explain the heavy loss of British vessels at the Battle of Jutland. The original dreadnoughts passed into history after the war, as almost all were scrapped under the terms of the Washington Naval Treaty of 1922. The Germans built the first prototype submarine in 1850, but it promptly sank in Kiel harbor during a test dive. However, by 1903 the Germans commissioned the first fully functional U-boat — Unterseeboot — and by the start of the war Germany had 48 submarines. The Kaiser opposed unrestricted submarine warfare, but agreed to a blockade around the British Isles. However, to effectively control the sea routes to and from England, the Germans would have to break out of the North Sea. 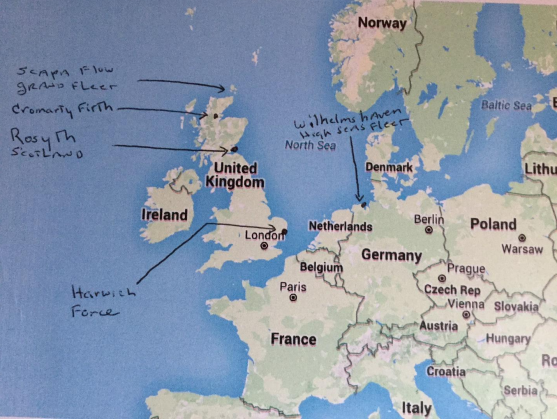 Unfortunately for the Germans, geography favored the British. 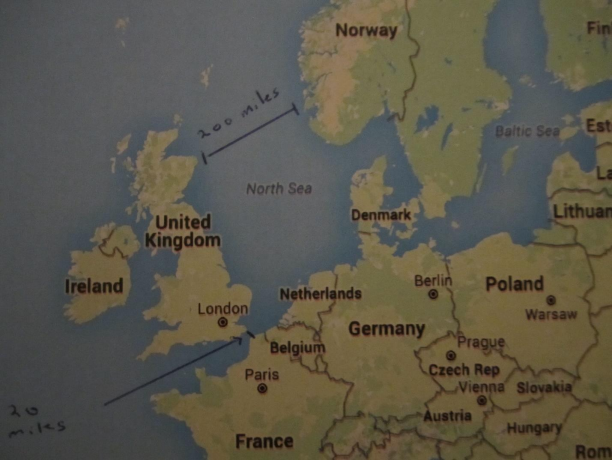 A glance at the map demonstrates that the British Isles themselves block access of the German navy to the world’s oceans by sitting astride the sea routes to Germany. The British strategy was to blockade the German High Seas Fleet based at Wilhelmshaven by controlling the northern and southern passages to the North Sea but avoid direct engagement which would risk their capital ships. The HMS Tipperary, my grandfather’s ship, was based at Scapa Flow and led the 4th Destroyer Flotilla a contingent of 12 destroyers attached to the Grand Fleet. The British Grand Fleet, based primarily in the large natural harbor of Scapa Flow in the Orkney Islands with a supplemental force harbored in the Cromarty Firth in Scotland, was relatively well-protected from German submarines but was too far from the east coast of Britain to provide protection from German naval raids. In the south, the Harwich Force, based in Harwich, opposite Amsterdam, was designed to engage light German naval forces and prevent mining of the English Channel. Midway between the Grand Fleet at Scapa Flow and the Harwich Force in the south was the Battle Cruiser Fleet, based at Rosyth, near Edinburgh, providing a strong rapid response to German incursions into the southern region of the North Sea. The commander of the Grand Fleet was Adm. John Jellicoe. Born in 1859, Jellicoe was sent to sea as a cadet at the age of 12. No stranger to danger, he survived the sinking of Victoria in 1893 and a gunshot wound to the left chest in 1900 during the failed Anglo-German rescue of the European Peking Legation during the Boxer Rebellion. His keen intelligence and unflagging industry, combined with a long relationship with the First Sea Lord Jackie Fisher, ensured a rapid rise through the ranks. On the eve of the war he was the “coming man” and was given command of the Grand Fleet. He proved to be analytic, conservative and cautious. Vice Adm. Sir David Beatty was in command of the 1st Battlecruiser Squadron based in Rosyth. Born in 1871, he went to sea as a cadet at the age of 13, where his performance was distinguished primarily by misbehavior. He first achieved distinction in 1896 when he assumed command of a river gunboat after his commander was wounded during the Siege of Khartoum. Lord Kitchener was so impressed that Beatty was recalled to service when the campaign resumed in 1897. Beatty was also wounded during the Boxer Rebellion. Handsome, brave and audacious, he was just the sort of man to appeal to Winston Churchill, who promoted him over the heads of his superiors to command the squadron. Capt. Charles Wintour was the commander of the 4th Destroyer Flotilla based at Scapa Flow and captain of HMS Tipperary, my grandfather’s ship. Born in 1871, the son of a vicar, Wintour was 44 years old when he died on the bridge of Tipperary at approximately midnight on May 31, 1916, leaving behind a wife, a daughter and a son. 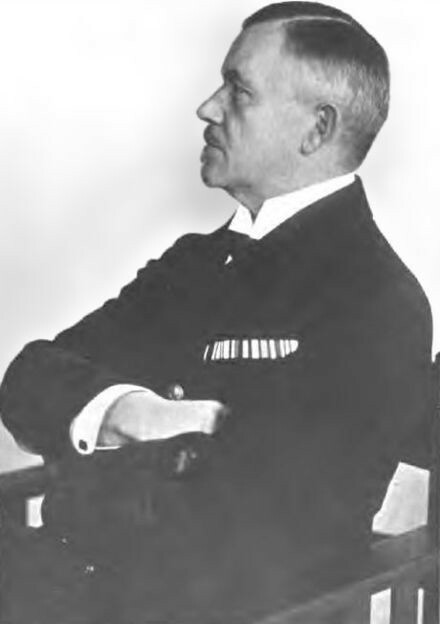 These men’s opponent was Adm. Reinhard Scheer, commander-in-chief of the German High Seas Fleet. Like Jellicoe and Beatty, Scheer was a highly experienced naval officer with multiple sea commands and extensive training in naval ordinance prior to the onset of the war. He assumed command of the High Seas Fleet in January 1916. Aggressive by nature, Scheer planned to lure the Grand Fleet out of their secure bases by a feint and cripple it with torpedoes launched from submarines lying in wait and bombardment by the surface ships of the High Seas Fleet. In the spring of 1916, Scheer ordered all German submarines to abandon the hunt for merchant ships and to position themselves under the likely routes of the Grand Fleet. The operation was planned for May 17, but was delayed because of necessary repairs to the German battlecruiser Seydlitz damaged by mines during a recent raid on the English coast. By the end of May 1916, the High Seas Fleet was ready to sortie and engage Jellicoe’s Grand Fleet, but the German submarines had already been at sea for a prolonged period. Submarines of that era could only remain at sea for a limited time. By the day the High Seas Fleet finally set sail, the submarines had overstayed their time at sea, were not fit for combat and played almost no role in the battle. Vice Adm. Franz von Hipper was the commander of the 1st Scouting Group attached to the High Seas Fleet. He had extensive experience leading raids on English coastal towns since the beginning of the war. He took a five-week leave at a spa in early 1916 to recover from combat fatigue and then returned to the fleet to resume command of the 1 Scouting Group. In 1914, the British Navy established a cypher unit in Room 40 of the old Admiralty Building. Captured code books from disabled German vessels enabled the secret unit, code name “Room 40,” to monitor all German naval and diplomatic communications. And so on May 30, 1916, when Scheer ordered von Hipper to sea with the 1st Scouting Group, comprising five battlecruisers, five light cruisers and 30 torpedo boats, Room 40 alerted Jellicoe. The Grand Fleet immediately put to sea from Scapa Flow and the Cromarty Firth and the 1st Battle Cruiser Squadron, commanded by Beatty, sailed from Rosyth. They were able to pass over the impotent German submarine screen. Jellicoe had arranged to rendezvous with Beatty 90 miles off the entrance to the Skagerrak Strait between Denmark, Norway and Sweden at 2:00 in the afternoon on May 31. Scheer’s plan was to lure only a portion of the Grand Fleet to sea. “Not a man in the German fleet, not even the commander-in-chief” suspected that the entire Grand Fleet was steaming toward them. Similarly, no one in the English fleet knew that the entire High Seas Fleet had put to sea because of the failure of the Admiralty to transmit this information to Jellicoe. Finding the enemy was a challenge in the days before radar and satellites. Spotter planes were of limited value due to the technology of the times, so lightly armored battle cruisers were sent out by both fleets to hunt for the enemy. At 2:10 in the afternoon on May 31, as Beatty was preparing to turn north to rendezvous with Jelllicoe, one of his battlecruisers, Galatea, sighted two German destroyers, an advance screen of von Hipper’s Scouting Group. The initial gun battle lasted 55 minutes, during which time two British battlecruisers, Indefatigable and Queen Mary, were sunk, killing more than 2,000 sailors. Scheer followed Beatty’s run to the north until he encountered Jellicoe and the Grand Fleet in the fading light about an hour later at which point, as you can see from the map in the lower right panel, he executed two 360 degree turns and began his escape to the south towards the safety of Heligoland Bight minefields near the coast leading to Wilhelmshaven. Why did Scheer make two 360-degree turns? The answer is that Jellicoe crossed the “T” of the High Seas Fleet on two occasions, first when Scheer ran straight into him and again when Scheer attempted to push his way through the Grand Fleet to make his escape after the first 360-degree turn. “Crossing the T” was a naval maneuver that was impossible before the introduction of steam turbine engines and rotating guns at the end of the 19th century — and now obsolete because of missiles and air power. 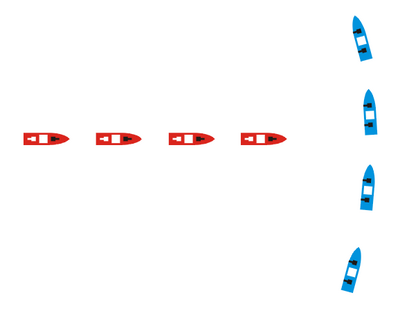 In effect, Jellicoe’s force — the blue ships in the below art — steamed at a 90-degree angle to the German High Seas Fleet — the red ships — so that only the forward guns of the first German ship in the line could be fired. Luckily for Scheer, there was fog, fading light and smoke from the vessels, allowing him to skillfully maneuver his entire fleet — not once, but twice — away from certain destruction. Jellicoe had formed a “V” around the High Seas Fleet and was attempting to cut off its escape to the southeast toward the protection of the Heligoland Bight minefield. In the darkness, without radar or effective radio communication, the main force of the Grand Fleet unknowingly passed south of the High Seas Fleet and Scheer was able to punch his way through the trailing lightly-armed British destroyer screen shortly before midnight. Unfortunately for my family, Tipperary was the first destroyer to encounter the combined fire of the German light cruisers and the heavy batteries of the battleships Westfalen and Nassau. By 3:30 in the morning, Scheer had made his escape into the minefield en route to Wilhelmshaven before Jellicoe was aware of the situation. Tipperary displaced 1,610 tons and had six four-inch guns and a secondary armament of four 21-inch torpedo tubes. She could make a top speed of 31 knots and had a complement of 197 crew members on her final voyage. The naivité of the young sailors spoiling for a fight would soon be tempered by the carnage of exploding ordinance. Many of these sailors were little more than boys. In fact, a common rank in the Royal Navy at that time was “boy first class.” Older professional chief petty officers, such as my grandfather, served as paternal figures and no doubt were leery of the impending battle. All that abruptly changed when the 5th Battle Squadron encountered von Hipper’s “feint” at about 2:10 in the afternoon on May 31. At this point, Tipperary was with the Grand Fleet five and a half hours’ steaming time to the north. As the battle proceeded southward, Beatty’s 5th Battlecruiser Squadron encountered the main body of the High Seas Fleet at 4:43 P.M. He promptly turned north, luring Scheer toward Jellicoe. Tipperary would have entered action at around 5:43 or so in the evening. As soon as Scheer recognized that he was up against the might of the entire Grand Fleet, he made his 360-degree turn and then unsuccessfully tried to engage a portion of Jellicoe’s force again in order to make good his escape. The commander of the flotilla, Capt. Charles John Wintour, could see neither the British nor the German fleets. Wintour and the other destroyer commanders feared a “friendly fire” accident due to the difficulty of correctly identifying ships in the darkness. “Still they made no sign, and at last, as they were evidently drawing ahead of him and had closed to less than 1,000 yards, [Wintour] ventured to give the challenge,” the official history explained. It was a decision that led to disaster. Sub-Lt. Newton William-Powlett, one of the few survivors, was at his station manning the three aft guns on Tipperary. “They were so close that I remember the guns seemed to be firing from some appreciable height above us,” William-Powlett recalled. “At almost the same instant, the Tipperary shook violently from the impact of being hit by shells. I was told afterwards that the first salvo hit the bridge and it must have killed the captain and nearly everyone there. I opened fire with the after guns as soon as the enemy opened on us. The other destroyers of the flotilla engaged the enemy but they were no match for the battlecruisers and the battleships Westfalen and Nassau. Spitfire, the destroyer second in line after Tipperary, was severely damaged by incoming fire. Unable to fire her remaining torpedoes, she returned to assist Tipperary. Suddenly, out of the darkness, steamed the 20,000-ton battleship Nassau, heading straight for the 935-ton Spitfire. A devastating head on collision occurred. Despite severe damage from the crash and simultaneous shellfire, Spitfire miraculously remained afloat and made its way back to port. “For about two hours the ship floated in this condition,” William-Powlett wrote, “during which time we employed ourselves getting the wounded aft on to the quarter deck and covering them with officers’ bedding from the cabins and in putting out two small fires which commenced aft. We also collected all the confidential books, and placed those not already in steel chests into weighted ammunition boxes, ready to throw overboard in an emergency. “Shortly before 2:00 A.M., the 1st lieutenant noticed that the ship was going and gave the order, ‘Everybody aft.’ The ship heeled slightly to starboard, then the bows gradually went under. The 1st lieutenant ordered, ‘Everyone for themselves’ and we clambered over the side into the sea. It is impossible to know whether my grandfather was alive or dead at this point. I can only hope that he was killed instantly in the initial bombardment, but given the fact that his body washed ashore on the beaches of Norway, I think it highly likely that he entered the water alive wearing a life jacket. What was it like to enter the frigid waters of the North Sea in the pre-dawn half-light approximately 47 miles from the Norwegian shore? As an experienced open-water swimmer, I have experienced the initial shock of the 47-degree waters of San Francisco Bay in winter. This is approximately the temperature of the North Sea in the early summer season at 57 degrees, 47 minutes north latitude and five degrees, zero minutes east longitude, the location of Tipperary at the time of her sinking. There is an angina like pain in the feet, hands and especially the face. The shock takes your breath away and stimulates rapid strokes in an effort to get warm. The pain in the face is so severe that you have to float on your back after 100 yards or so in order to get your face out of the water. In the pitch black of night, your mind begins to play tricks, imagining some sea creature reaching up to grab you from the depths. After 200 yards or so of swimming, the pain lessens. As you continue swimming, the cold, which initially abates, returns — and with time both your stroke and mind slow. Depending on your fitness, layers of fat and the water temperature, the time each person can stay alive in cold water varies. Now imagine what it’s like to enter such water after being in combat for more than 24 hours, hungry, without physical training, possibly injured, approximately 47 miles from shore, knowing that you are likely going to your death. “I started off trying to get clear of the ship as I was afraid of being sucked down by the eddies,” William-Powlett recalled, “but could make no headway for some time, probably because I was trying to swim windward, and it was not until I swam round the stern of the Tipperary and pointed down to leeward that I got any distance from her. “I heard a commotion behind me, and looking over my shoulder saw the last of the stern just disappearing, so I swam hard for a bit. I now found myself some distance from the 30 odd swimmers — amongst whom I noticed Peter, our 1st lieutenant’s white-haired terrier — with the Carley raft further to leeward. But with more time in the water “the cold … had sort of numbed my brain and I now had only one idea left — to reach the raft — and I eventually reached it. It was overcrowded, but they pulled me up on it, an engine room artificer on one side of me and a red-haired marine on the other side, and I had room to sit on the edge. 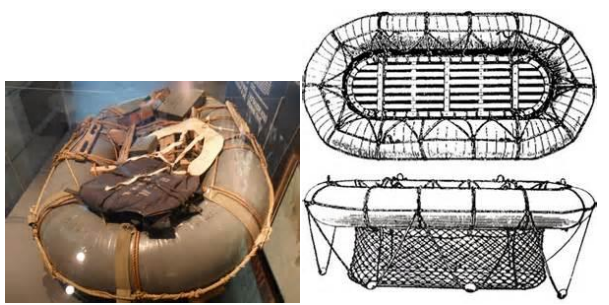 “The raft, supporting about 30 men, was about a foot under water — it’s a hollow, copper, oval-shaped affair with lifelines and things to hang on by — and as the night drew on a swell got up and the seas washed up and down over our middles, like the waves when one first wades out bathing, only much colder. “We sang various popular songs, but I suppose because I had got colder swimming about than the others who had been on the raft all the time, I could not think of the words and my music was all of one note. When at last daylight gradually appeared, we made out the shape of a small ship, apparently steaming round and round in circles. In the close-quarters combat following the shelling of Tipperary, the helmsman of HMS Broke was killed and as he fell dead he took the wheel with him, causing Broke to crash into Sparrowhawk with devastating effect. The two destroyers were locked together when a third destroyer, HMS Contest, sliced off about six feet of Sparrowhawk’s stern. Of the original 23 survivors on the Carley raft, three were dead in the boat, five died after being pulled up on Sparrowhawk’s quarter deck and a further eight were unconscious. The survivors of Sparrowhawk and Tipperary were transferred to HMS Marksman and Marksman then fired on the crewless, disabled Sparrowhawk until she sank beneath the waves. Nine other Tipperary crewmen were picked up by the German destroyer S53. Eight of these men survived and became prisoners of war. The last survivor of Tipperary was rescued in the early morning of June 1. Able Seaman Albert Cave aboard HMS Dublin spotted a figure waving in the water. Of the 197 souls aboard Tipperary, only 12 ultimately survived, including the eight who became prisoners of war. Although the British Grand Fleet enjoyed a numerical advantage over the German High Seas Fleet of 37:27 in heavy units and 113:72 in light support craft, British losses amounted to 6,784 men and 111,000 tons, compared to German losses of 3,058 men and 62,000 tons. Altogether 249 ships were engaged in the battle — 151 British and 99 German. Ten percent of the 96,000 combatants were either killed or wounded. 5,672 British and 2,115 Germans lost their lives. Following the Battle of Jutland, the Germans declared victory. Britain was in a state of shock as its vaunted navy, the pride of the nation, had seemingly been bested by the Germans. Jellicoe was severely criticized for excessive caution, especially by Beatty. There is an entire literature analyzing the Battle and the question of victory. This is not the place to analyze the multiple errors made by both sides during the Battle. Suffice it to say that the major errors on the British side were faulty, frequently absent, communication and insufficient training in both gunnery and night-time maneuvers. From a tactical point of view, the loss of life and ships was certainly greater for the British. However, from a strategic vantage, the High Seas Fleet ventured forth only two additional times for minor sweeps following the battle and mutinied at the end of the war, sparking the German revolution of November 1918. Historians and armchair strategists may debate the outcome of the battle, but I am more concerned with the devastating loss of my grandfather. He left behind a young wife to raise their three children, Ann, George and Jack, whom she initially supported by scrubbing the floors of the Admiralty. Fortunately, around 15 years later, some happiness came into her life. A former suitor, William Smith — who had emigrated to New York in despair after failing to win my grandmother’s hand — had heard that my grandfather did not survive the war. Each year he returned to England to search for her. Unbelievably, her family would not inform him of her whereabouts. However, he who persists, wins. Around 15 years after the battle, Smith knocked on one of my grandmother’s relative’s door, was informed that my grandmother was not present and left in disappointment. After walking a block, he realized he had left his umbrella in the foyer. When he knocked again, my grandmother opened the door! They married and returned to New York with her youngest son Jack. But, our grandmother was very unhappy in New York without her other children and Smith wrote to my mother and asked her to come. My mother Ann, who was studying nursing, had no real interest in emigrating to America but agreed to go for my grandmother’s happiness. My Uncle George and Aunt Edith also tried living in New York in 1939 but soon returned home to England in 1940. My mother was very affected by the loss of her father. Many decades later, when she read the poem that I wrote about my visit to Grandfather’s grave, she cried, one of the few times that she cried during my lifetime. World War I, the war to end all wars, was followed 21 years later by World War II. Future historians will no doubt consider them part of the same conflict resulting in the destruction of the old order. All three of George and Jane’s children served in the military during World War II. 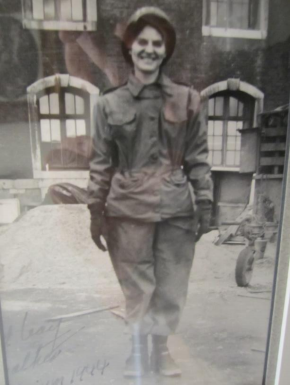 My mother Ann served as a U.S. Army nurse during the Normandy invasion and the Battle of the Bulge. She ended the War in Aachen, Germany. the Royal Navy, following in the footsteps of his grandfather and father. His plans were derailed by a bout of pleurisy and he became a chemical engineer. Uncle Jack, a pharmacologist, served as a U.S. Army officer at the Horn Island Chemical Warfare Quarantine Station near Pascagoula, Mississippi. He worked on chemical weapons, which were not used tactically during the war. After the war, he worked at the Edgewood Arsenal in Maryland. When my grandmother asked him about his job in the Army, he famously told her that he was washing windows! By coincidence, I took a one-week course in chemical warfare 50 years later at the Edgewood Arsenal. The tradition of naval service continues in the Saunders family. Peggy and Si’s son, Steve Adam, is an aviator in the U.S. Navy. 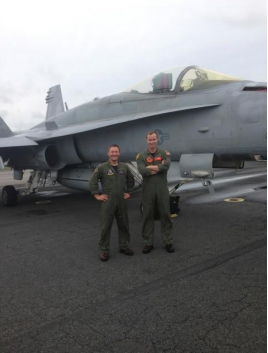 I am sure his great grandfather would be both proud of his service — and amazed that his great grandson is flying supersonic jet fighters off of carrier decks in the middle of the ocean. George and Jane’s grandchildren owe them a debt of gratitude for having brought into the world and raised three spectacular people who became our parents. Despite the hardship of growing up in a single-parent household in tenuous economic circumstances, they all excelled and were themselves excellent parents. 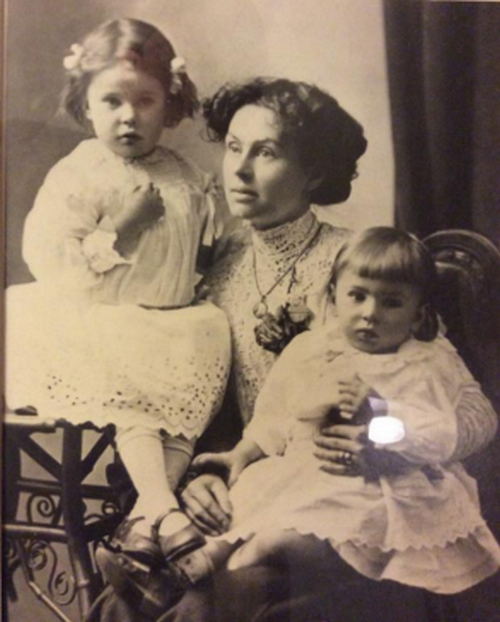 On the occasion of the 100th anniversary of our grandfather’s death in the Battle of Jutland, I am proud that his descendants have come together to honor his memory and recognize the achievement of his wife, our grandmother, in raising the family alone. I flew to find my grandfather. To search for his new home. To many a far shore. To the colors he did fly. He marched off to war to die. Lifelines to his island home. Of one dark and stormy night. Woke her with a fright. Though but a child of eight. To spy upon the gate. His image was a blur. To bid his last farewell. As he gazed at his young wife. And took refuge from the night. “The torpedoes struck at sunrise. Our ship exploded and burned. And left to join his mates. They sailed to meet their fate. The cream of the Kaiser’s fleet. Sailors rushed to their stations. And disappeared in a roaring blaze. Did you perish in the explosion? Did you feel the searing heat? Or with death fades, no one can say. By the shore of a lovely fjord. Killed in a senseless war. When I arrived on a fine spring day. He smiled and led the way. He sleeps among his comrades. His grave is tended with care. And self-consciously uttered a prayer. Over this grave with a cross. I sought to touch his spirit. Cmdr. Georg von Hase, SMS Derfflinger, 1st Scouting Group, High Seas Fleet in Nigel Steel and Peter Hart. Jutland 1916 Death in the Grey Wastes. London: Cassell, 2003, p. 59. Available here. Last accessed Jan. 22, 2016. Available at The Fallen of Ewhurst and Ellen’s Green, Surrey. Charles Robert Francis. Ewhurstfallen.co.uk. Last accessed Jan. 10, 2016. Midshipman John Croome, HMS Indomintable, 3rd Battlecruiser Squadron in Nigel Steel and Peter Hart. Jutland 1916 Death in the Grey Wastes. London: Cassell, 2003, p. 48. Midshipman John Croome, HMS Indomintable, 3rd Battlecruiser Squadron in Nigel Steel and Peter Hart. Jutland 1916 Death in the Grey Wastes. London: Cassell, 2003, p. 49. Cmdr. Georg von Hase, SMS Derfflinger, 1st Scouting Group, High Seas Fleet in Nigel Steel and Peter Hart. Jutland 1916 Death in the Grey Wastes. London: Cassell, 2003, London, p.52. Seaman Torpedoman Harry Hayler, HMS Warspite, 5th Battle Squadron in Nigel Steel and Peter Hart. Jutland 1916 Death in the Grey Wastes. London: Cassell, 2003, London, p. 56. Cmdr. Walter L. Allen, HMS Broke. After Action Report, June 3, 1916. Available here. Last accessed Jan. 10, 2016. R.B.C. Hutchinson, commander, Achates. After Action Report, June 3, 1916 Available here. Last accessed Jan. 10, 2016. Extract from the official history: Naval Operations by Sir Julian S. Corbett, 1923 available here. Last accessed Jan. 15, 2016. Nigel Steel and Peter Hart. Jutland 1916 Death in the Grey Wastes. London: Cassell, 2003, London, p. 310. Extract from the official history: Naval Operations by Sir Julian S. Corbett, 1923. Available at northeastmedals.co.uk. Last accessed Jan. 15, 2016. The Fallen of Ewhurst and Ellen’s Green, Surrey. Charles Robert Francis. Ewhurstfallen.co.uk. Last accessed Jan. 10, 2016. Sub-Lieutenant Newton William-Powlett, HMS Tipperary, 4th Flotilla in Nigel Steel and Peter Hart. Jutland 1916 Death in the Grey Wastes. London: Cassell, 2003, London, p. 311. Lieutenant Athelstan Bush, HMS Spitfire, 4th Flotilla in Nigel Steel and Peter Hart. Jutland 1916 Death in the Grey Wastes. London: Cassell, 2003, London, p. 314. R.B.C. Hutchinson, commander, Achates. After Action Report, June 3, 1916. Available here. Last accessed Jan. 10, 2016. Ashtead War Memorials — WW1 Telegraphist Harry Burfitt, Royal Navy, HMS Tipperary. Available here. Last accessed Jan. 15, 2016. Sub-Lieutenant Newton William-Powlett, HMS Tipperary, 4th Flotilla in Nigel Steel and Peter Hart. Jutland 1916 Death in the Grey Wastes. London: Cassell, 2003, London, p. 377. Sub-Lieutenant Newton William-Powlett, HMS Tipperary, 4th Flotilla in Nigel Steel and Peter Hart. Jutland 1916 Death in the Grey Wastes. London: Cassell, 2003, London, pp. 377–378. 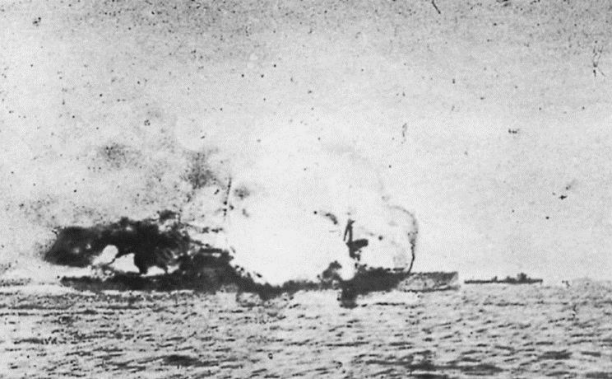 The Fighting at Jutland. Available here. Last accessed Jan. 15, 2016. Able Seaman William Cave, HMS Dublin, 2nd Light Cruiser Squadron in Nigel Steel and Peter Hart. Jutland 1916 Death in the Grey Wastes. London: Cassell, 2003, London, p. 399. 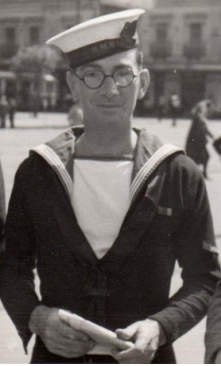 Leading Seaman Thomas Clifford, HMS Fortune, 4th Flotilla, in Nigel Steel and Peter Hart. Jutland 1916 Death in the Grey Wastes. London: Cassell, 2003, London, p. 323. Available here. Last accessed Jan. 19, 2016.